Collecting modern masters? Start small and practical, with reissued classic Dansk enamel cookware. 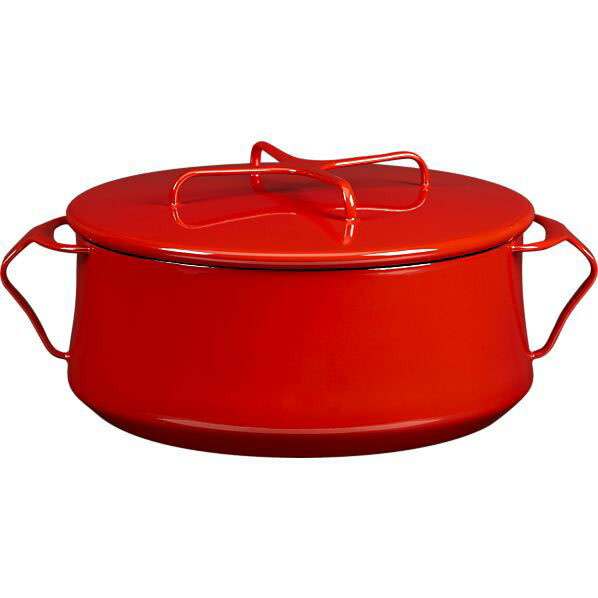 The classic, curvy mod casseroles from Dansk are no longer just lucky vintage store finds; Crate and Barrel has a line of reissues. You can breathe a deep sigh of relief: yet another well-loved modernist design classic is rising from the grave (or the "discontinued" category) and being reissued. Crate & Barrel has recently revived pieces from the graceful Danish modern Dansk enamel cookware line originally designed by Jens Quistgaard in the 1950s. Not all things mod become well-loved and ever-appreciated; some are just fun or kitsch, quirky collectibles full of character. But some pieces from the middle-20th century do garner long-lasting appreciation from mid-century modernist lovers and others. Dansk is like that. Dansk International Designs began in 1954, and has worked its way into the collections of New York’s MOMA, the Louvre, and the Cooper-Hewitt. Dansk Kobenstyle Enamelware was in production from 1956 into the ‘80s, but since then had been a vintage store/eBay find only. Good thing that’s changed. Despite the Danish-sounding name, and the Danish designer (Jens Quistgaard) who co-founded the company, the company was an American business from the start, the other founder being American entrepreneur Ted Nierenberg, who’d traveled to Copenhagen and discovered Quistgaard’s work. Manufacturing was first in Denmark, but by the mid-1960s moved to France. Vintage Dansk enamel cookware bears the marks of either early or later production: a “four ducks” symbol in a circle for the earliest (most sought-after) 1950s pieces, and a “Dansk/Made in France/IHQ” stamp for the later productions. “IHQ” was the sign for designer Jens Quistgaard. The handsome, stovetop to tabletop design and lightweight enamel clad steel made the pieces popular from the start. The lid could be lifted by slipping a spoon under its handle; it could also be taken to the table and used as a trivet for the dish.